Could this be the time for you to ‘Mangez Bien’ at La Mangeoire? 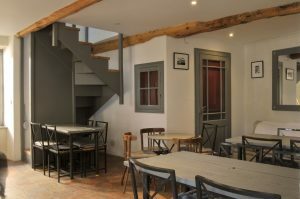 In the centre of the charming medieval town of Caunes Minervois, close by ancient fortifications, La Mangeoire sits in the sunshine of the Aude. 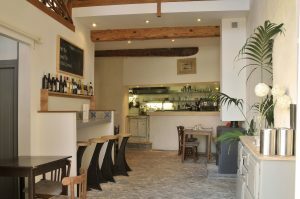 With al fresco seating beside the fountain of a pretty village square, shaded by plane trees, it seduces … many arrive to sit and savour its food and then keep coming back to eat again! Paying the equivalent of just one year’s rent on her Oxford premises, they bought the building and Ollie’s husband Daniel Fenton, a gifted blacksmith, together with her brother, set about transforming the building. Today it seats 40 over two levels inside but they also rent space for seating outside in the square from the Mairie – it’s proven an irresistible combination! A feature of the interior is the stunning staircase balustrade, the creation of artist Charlie Whinney, an old friend of her husband. 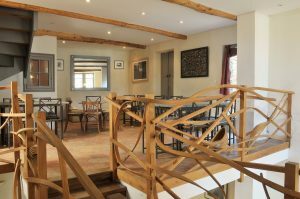 Crafted from a local chestnut tree and steam-bent into shape it’s a major talking point – especially as his work has been displayed at the V&A Museum, Chelsea Flower Show, Harvey Nichols and, thanks to the connection, now too in Caune Minervois! Together with her friend, Bridget Farrell, who was also involved in the Oxford enterprise, she quickly established a great reputation for food. “We source local products and focused on serving a variety of vegetarian food as well as more traditional fare and it’s very popular with repeat clientele. While we close for three months over winter, the rest of the year is always busy. There are thrice weekly markets over the summer months and we also hold music nights,” Ollie says. But wait there truly is more to this property, on the second floor are two ensuite bedrooms in an apartment which was until recently their ideal home. 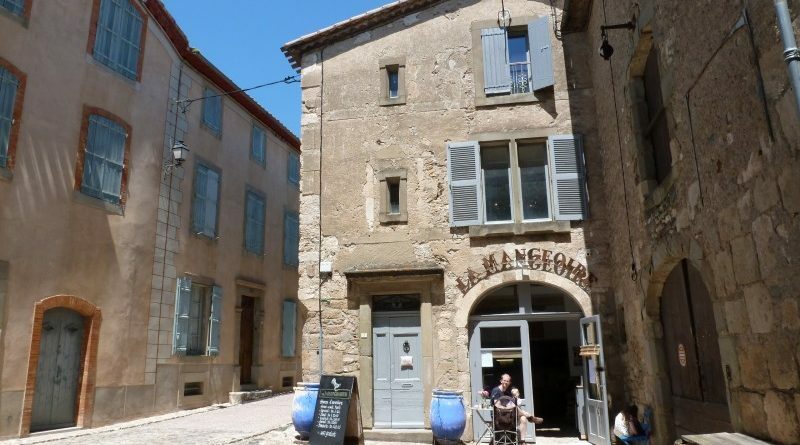 Time moves on, with two small children and Daniel’s flourishing artistic blacksmith business now taking centre stage, they decided to buy another house in the area and to sell La Mangeoire providing Ollie with the opportunity to focus on new projects. Inspired by this success story? Then find your very own business to start a new life in France here. 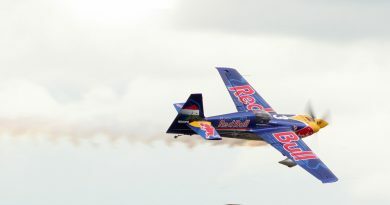 Cannes is getting acrobatic this weekend!